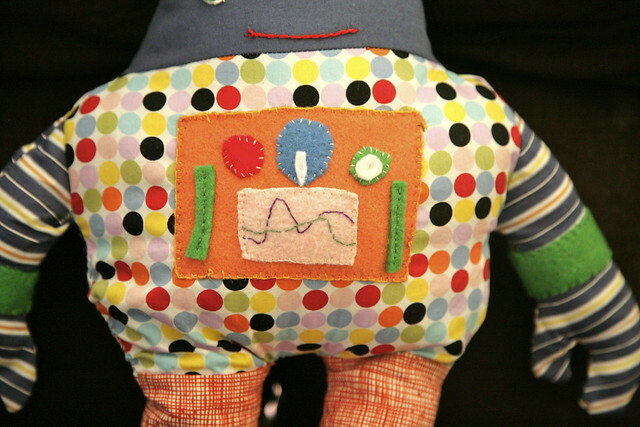 Inder Loves Folk Art: Snuggle Robot. Sometimes there's not a ton to say about a project. This started out as a gift for a small baby (hence I used felt instead of buttons for the details). 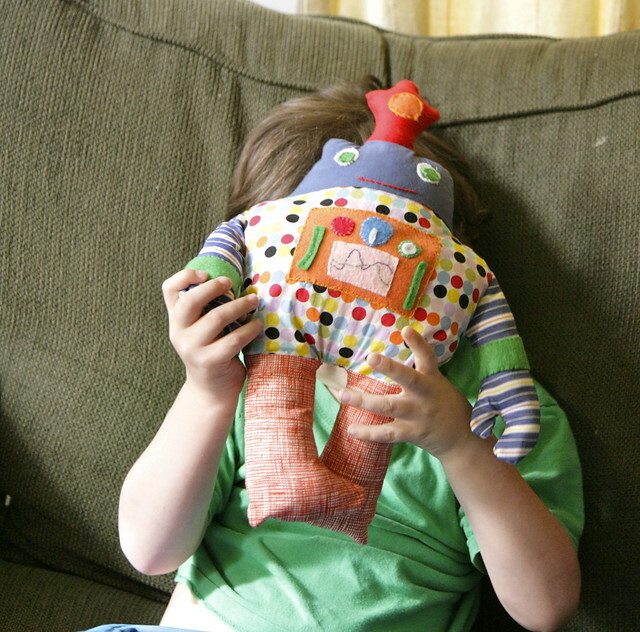 It's the Wee Wonderfuls Robot softie. The pattern is very simple, and it was really fun to make. It is a great way to use some of those small scraps of fabric and felt that are always threatening to explode out of my sewing corner and take over the entire house. The softie is sewn together by machine, then the details are added by hand (although you could easily do most of those by machine as well). I assembled it in an afternoon, and enjoyed the handwork while I was watching evening television. But when I was done, Joe claimed it as his own. 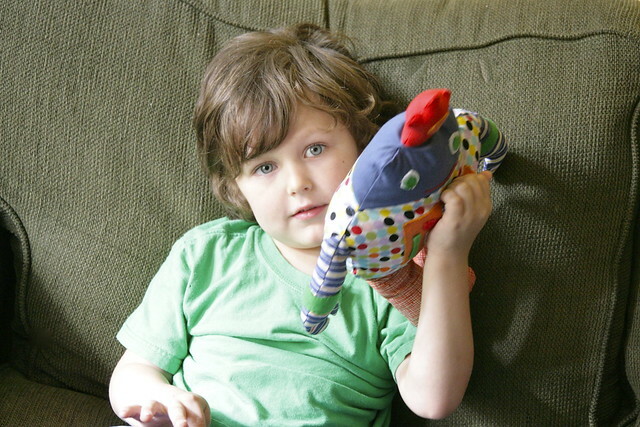 He asked very nicely if he could keep the robot, because "it is warm and snuggly." Then he took it to bed with him. Everyone needs a warm and snuggly robot, right? Well, I'm a sucker for those baby blues. Of course you can keep the robot, Joe. I guess I'll be making another one! It's so cute! I love Wee Wonderfuls patterns. 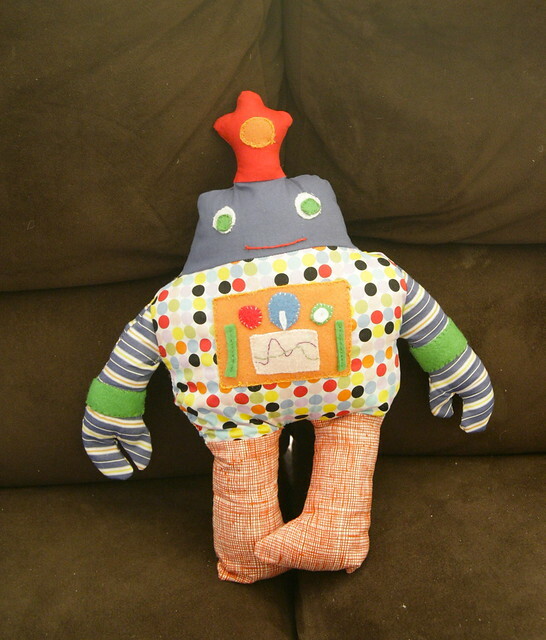 This is one of the few I don't have-- I wonder if my guys would want warm and snugly robots? I would have said yes, too! I love it, Inder, and Joe looks so sweet with it tucked under his arm! Those baby blues get me every time! They are both very cute! Awww, I love that he loves the stuff that you make! 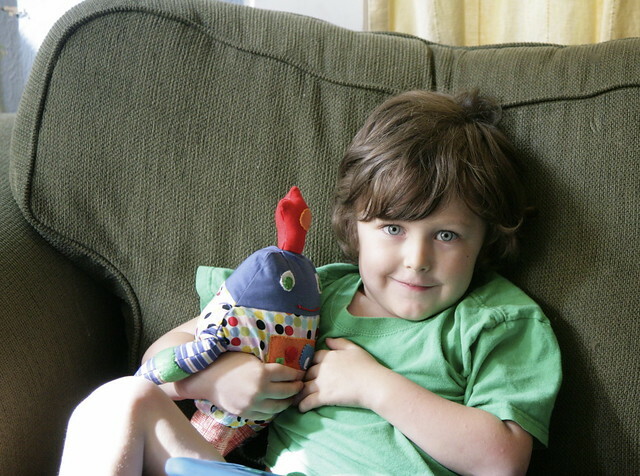 Such a cutie...him and the robot! Adorable robot! It is the best feeling when one of mine loves what I make. What utterly beautiful children you have. And the robot is awesome. A Few of My Favorite Things: the Nova Tote. Maggie wants what kind of backpack?